The Canal du Midi, a silky pale green liquid ribbon that meanders, connecting the Mediterranean port city of Sète to Toulouse is one of the most notable and oldest inland waterways of Europe still in use. The lofty dream of engineer Pierre-Paul Riquet to create a direct passage between the Mediterranean Sea and the Atlantic Ocean, bypassing the Strait of Gibraltar, enabling farmers and producers of wheat, wine, wools, silks, and salt a way to export their goods for trade. The 150-mile (240 km) Canal du Midi, completed in 1681, considered one of the greatest engineering feats of the 17th-century. Canal du Midi is a summit level canal, meaning that it passes over varying heights between valley’s and not in a lateral line. The canal rises on the Western end 206 ft (62.8 m) and falls 620 ft (190 m) on the Eastern side by way of 103 locks, one tunnel, and three aqueducts. The locks (écluses in French), which allow passage both up and down the canal’s varying heights may seem daunting at first. Each lock has a Lock Master who controls the opening and closing of the locks, along with the filling and emptying of the water in the lock. Many of the Lock Masters will offer advice as boats enter or leave the lock. Following the directions of the Lock Master is essential. Sometimes there may only be one boat in the lock, but many times the lock will be shared with as much as four boats. When that is the case, the boats will be within a few inches of each other. Several of the lock stations along the canal will have a small family run café or shop that is available for lunch, a glass of local wine, or a cooling ice cream cone. Designated as a UNESCO World Heritage Site in 1996, there are many highlights along the canal that you will want to stop and explore to create a magical and memorable vacation. Trebes is a charming town with several quaint restaurants located directly on the canal for waterfront dining. Trebes is an ideal spot for fresh Mediterranean seafood. A must do activity in Trebes for food lovers is to take a cooking class at Cooking by the Canal du Midi. The classes, taught in English, show how to recreate the diverse and flavorful dishes of France easily. Carcassonne, dating to the Neolithic period, is home to the famous Gallo-Roman UNESCO World Heritage Site La Cité – the world’s most substantial walled medieval fortress. The picturesque castle perched on top of a hill is built with its two outer walls in a concentric design with 53 towers to help protect the castle during times of siege. The castle still maintains a drawbridge over a waterless moat leading to the central keep. Carcassonne is also a modern city with many shops, cafés, and restaurants within walking distance of the port. Castelnaudary, the main port of the Canal du Midi and the birthplace of Cassoulet – a hearty stew of duck confit, sausage, and the haricot bean (a large white bean specific to the area). Learn the secrets of creating authentic Cassoulet here. The origination legend is that the defenders of the town were served Cassoulet during the siege of 1355. The dish is so revered; it is celebrated each August with a Fête du Cassoulet of parades, live music, festivities, and a Cassoulet bake-off. Toulouse, nicknamed la Ville Rose because of its extraordinary architecture built using rose colored terracotta bricks. Toulouse is also home to the European aerospace industry, the UNESCO World Heritage Site Basilica of St. Sernin – the largest Romanesque building remaining in Europe, and is France’s fourth largest city. one of the open-air markets in Toulouse. They are a great place to provision the boat. Buying a detailed guide for the Canal du Midi before you go is a must. A good guide will help you plan which towns you want to stop to explore, where markets are to reprovision, locations of wineries and other must-do activities. An important note to keep in mind is that Sunday is a family day, many businesses and retail locations close. France takes lunch seriously, nearly the entire country closes for lunch from 1- 2 in the afternoon during the week – this also includes the locks. For self-captaining, a pilot guidebook is highly recommended to pick up and read before your trip. It will offer tips on how to navigate locks and what to expect while on the water. It is a good idea to pack using collapsible luggage such as duffel bags that will fit into the small storage spaces within the boat. I get many of my luggage pieces from either Amazon or eBags. Another point to consider when packing is that most boats will have 12v plugins (car plugins) and not standard wall plugins for charging electronics. Packing a 12v adapter with both USB and outlet is a fabulous idea. Most of the ports along the Canal du Midi are easily accessible from Paris via road, airplane or the extensive rail system. Regardless if you choose to self-captain or hire a hotel barge, a vacation cruising the historic Canal du Midi will be a memorable and cherished experience for years to come. 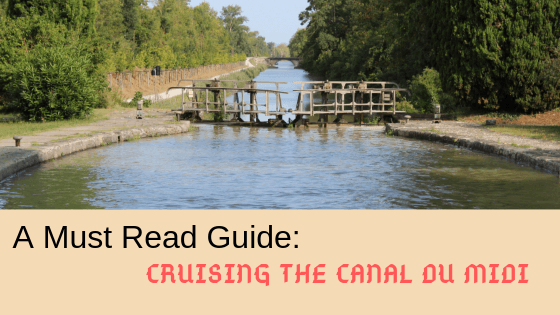 I hope reading this guide to cruising the Canal du Midi has been helpful to you while you make your plans. I hope this guide has helped you plan. Thank you for reading this travel nugget of knowledge about the Canal du Midi. This article may contain an affiliate link or two, which does not affect you in any way, but will allow Empty Nestopia to continue to bring you travel tidbits.